Today Pearl Abyss and Kakao Games have announced that they will jointly organize Black Desert Festa, a community event which will be held at the SETEC convention center in Seoul, South Korea. 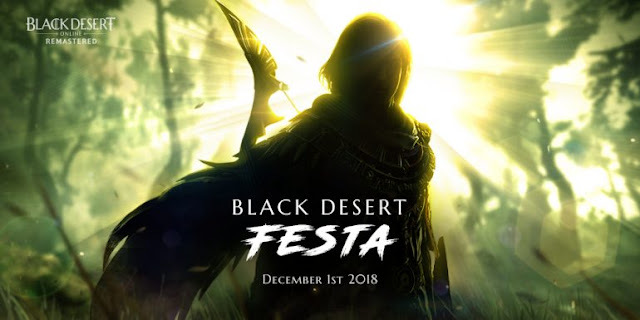 Black Desert Festa will take place on the 1st of December and will feature a keynote that showcases exciting new content, currently under development for Black Desert Online. To let Western audiences join the fun, the event will be fully live streamed with the keynote section subtitled in English. Black Desert Online content creators will be able to host the stream and share with their audiences. One of the announcements will include the release details of Archer, Black Desert Online’s long-awaited 17th class. Players will be happy to learn that starting today they can benefit from a whopping 1.000% bonus EXP to close off the Celebrating Millions event that was organized to reward the community for reaching 10 million registered users. Golden Bell, Book of Combat, Value Packs and other items that increase EXP can also be used with the event, providing a more pleasant environment for adventurers. Furthermore, bargain hunters can look forward to big discounts that can save up to 70% on selected items and new players can benefit from a 50% discount on Black Desert Online, regardless of the chosen package. For more information on the Black Desert Festa streaming schedule, participating streamers and more, please visit Black Desert Online’s official Twitch channel.